The Cleveland Cavaliers took a 2-0 lead over the Indiana Pacers in the first round series with a big game from Kyrie Irving (37 points), Kevin Love (27 points), and LeBron James (25 points). Paul George and the Pacers came back strong in the 4th quarter, but it wasn’t enough to pull out the win. Cavs 117, Pacers 111. In the other playoff game Monday night, Kawhi Leonard posted 37 points for the San Antonio Spurs to take a 2-0 lead over the Memphis Grizzlies. 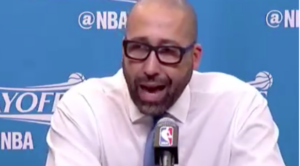 The Grizzlies first year coach David Fizdale blamed the referees for the team’s loss in his post-game press conference. In reference to the refs giving out more free-throws to the Spurs, he said, “that’s unprofessional. My guys dug in that game and earned the right to be in that game. And they did not even give us a chance. Take that for data!” Spurs 96, Grizzlies 82. More playoff games tonight and tomorrow! There were many great stories from the Boston Marathon on Monday. Edna Kiplagat of Kenya and Geoffrey Kirui of Kenya won the women’s and men’s top prizes taking home $150,000 each. The Americans had a great showing as well taking 2nd in the men’s division and 3rd place in the women’s division. At 70 years old, Kathrine Switzer, the first woman to ever run a marathon, returned to the race 50 years after her infamous debut. Switzer registered for the marathon in 1967 under the name K.V. Switzer. When an official noticed she was a woman, he tried to knock her off the course. Switzer’s debut was historic, but it still took another 5 years for women to officially enter the race.